Spiritualism—Progress, the Universal Law of Nature; Thought, the Solvent of her Problem / A Weekly Devoted to Spiritualism. Chicago, IL. Publisher: Progressive Thinker Publishing House. Editor: John Reynolds Francis; Mrs. Francis; Mrs. M.E. Cadwallader; C, Rudollph Malmberg. "The PT will be devoted to Spiritualism, Biology, Electro-Psychology (as formulated by the illustrated Dr. Dods), and its differentiations, Mesmerism, Animal Magnetism, and Hypnotism; Somnambulism, natural and induced, as presented by Dr. Fahnstock; Telepathy; Visions while awake, in sleep, or in Trance; Psychometry, as ably presented by Prof. Buchanan; cremation, a Spiritual and Sanitary necessity; Brain Waves, Psychic Waves, or Soul Force; Ethics as a Factor in Religion, and as annunciated by the Philosopher and Seer, Hudson Tuttle; the Various Stages of Death, in the Transition of the Spirit to Higher Spheres; the signs of Death; the Danger of Premature Internment, etc., etc." Francis (1832-1910) began his career as a liberal, abolitionist newspaper publisher in Bloody Kansas. For his pains he was captured and almost killed by Captain Quantrill’s Raiders before escaping. In 1869 he moved to Chicago to become an editorial writer and then associate editor for the Religio-Philosophical Journal and was eventually fired by Col. Bundy, the editor, because he “always abused the Bible and superlatives.” The Progressive Thinker is important in later American spiritualism because it was the the pre-eminent spiritualist journal from the mid-1890s on, acting for a time as the (unofficial) organ of the National Spiritualists Association. 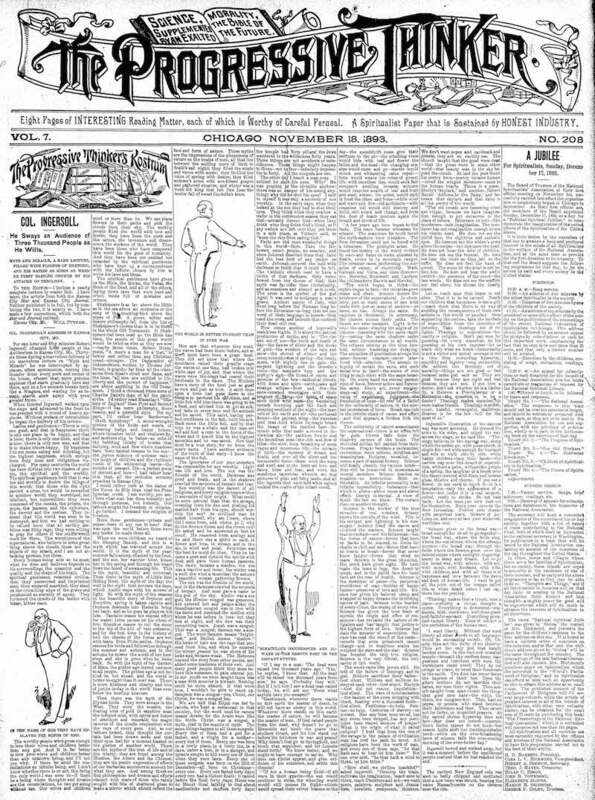 The journal combined traditional reform elements (Col. Ingersoll’s agnosticism, anti-Catholicism, free speech and women’s rights) with spiritualism, tempering the latter with regular coverage of the exposure of fraudulent mediums and, over time, with regular contributions on New Thought and occultism. The Progressive Thinker Publishing House also published and distributed as “premiums” for subscribers a wide variety of works, including Nicholas Notovitch’s The Unknown Life of Jesus, Emma Hardinge Britten’s Art Magic and Ghost Land and A.A. Farnese’s A Wanderer in the Spirit Lands (1901). From the 1890s into the early twentieth century the journal regularly publicized the work of Olney H. Richmond and his influential Order of the Magi (OOM). See the note under Star of the Magi. It also featured (1893-1894) the early contributions of John E. Richardson (”T.K.”),the proponent of the Great Work. See the note under Life and Action. Regular contributions by W.P. Phelon (the journal serialized his novel The Witch of the Nineteenth Century), and by leading spiritualists of earlier times, including J.R. Buchanan, Moses Hull, J.M. Peebles and Hudson Tuttle. In the early days the journal ran novels, most notably Maria Monck which detailed the horrors and sexual abuse said to be prevalent in convents of the time. For a short biography of Francis and his photograph, see Effa Danielson, “A Sketch of the Rise of Spiritualism,” Occult Digest, March 1928. Mrs. M.E. Cadwallader (1910-1935) bought the journal from Francis’s widow in 1910 and ran it for another quarter century. NSAC, Lily Dale; Skidmore Library, Lily Dale (later issues); Microfilom (1890-1910) at Kansas Historical Society; LOC; NYPL; University of Texas, Austin. NB: The volume structure of the periodical is irregular: there are, as far as we can determine, no Volumes 10 or 11, and Volume 13 includes a single issue. As such, pay attention to issue numbers rather than volume numbers. From Issue 200 onward, this run is complete.